It’s one of those gorgeous February days, snow falling slowly from the sky covering the city in a romantic blanket of white. Everything slows down for a minute and you can just soak up the beauty winter in the city has to offer. Then comes slush, nothing like a nice heavy mid day rain to perfectly pair with the icy tundra, and as you wade through the slush on your way to work, it’s time to think about what will be making this all worth while. Here are some more of our favorite food truck lunches, to make having left the house this morning worth it. With a warm flaky savory pie, you can pretend you’re relaxing down under, chowing on some of the finest meats and veggies we can get in the city. All wrapped up in a warm steamy pie. 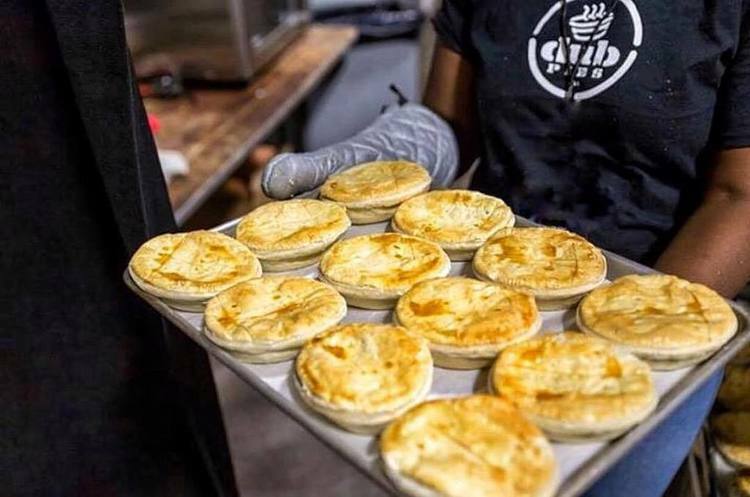 DUB Pies, the down under bakery, has spots all around the city to serve you up something that will warm your belly and soul when you’re frozen to the bone. A perfect winter treat, that will make you want summer to stay away a bit longer. Music to out taste buds, another flaky hand held favorite: The Empanada Sonata, dishes out perfectly golden brown nuggets of warm tasty goodness. Stuffed with pulled pork, Cajun shrimp, and even warm Nutella and banana to satisfy that sweet tooth – these small but mighty concoctions bring the heat. Sometimes when your toes are frozen solid, the only thing that can thaw them out is some nice spicy bulgogi. Korilla BBQ is Korean comfort at its finest. Tacos, burritos, and bowls, whatever form you want your BBQ in – it’s sure to please.